A pumpkin is a large orange gourd related to the squash and muskmelon. They are popularly used in pies and soups. The seeds, which are known as "pepitas" are often husked and roasted to produce a nutty snack food. Pumpkins are typically orange or yellow and have many creases running from the stem to the bottom. They have a thick shell on the outside, with seeds and pulp on the inside. Colors: Although pumpkins are usually orange or yellow, some fruits are dark green, pale green, orange-yellow, white, red and gray.. Choosing: Pumpkin should be fully ripe with firm rinds, bright orange color, and fairly heavy weight. When selecting a pumpkin for cooking, the best selection is a "pie pumpkin" or "sweet pumpkin." These are smaller than the large jack-o-lantern pumpkins and the flesh is sweeter and less watery. However, you can substitute the jack-o-lantern variety with fairly good results. Buying: Look for a pumpkin with 1 to 2 inches of stem left. If the stem is cut down too low the pumpkin will decay quickly or may be decaying at the time of purchase. 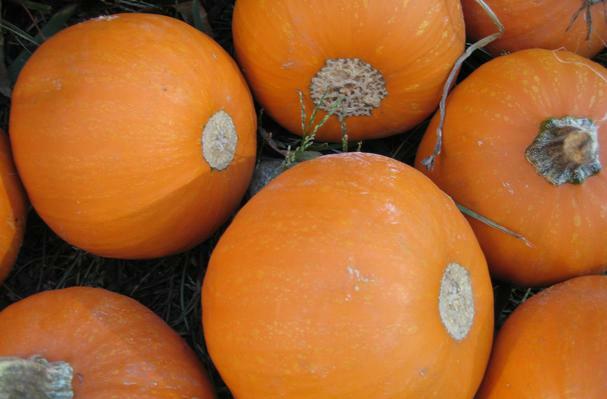 Avoid pumpkins with blemishes and soft spots. It should be heavy, shape is unimportant. A lopsided pumpkin is not necessarily a bad pumpkin. Figure one pound of raw, untrimmed pumpkin for each cup finished pumpkin puree. Procuring: Any good, well drained soil will grow pumpkins. A soil of medium texture is best but good results can be produced on heavy or light soils if they are properly tilled and well fertilized. Pumpkins are moderately tolerant of acid soils and the preferred pH range is 6.0 - 6.8. Direct seeding should not be attempted until the soil has warmed up and is in good condition for germination (usually after May 15). You can buy seeds of many varieties at any lawn and garden store. But start out with only one or two kinds until you get the hang of it. If you live in a drier, more arid area, seed can be planted up to 1.75 inches deep to keep them in a moisture zone. Normally, shallow cultivation just enough to control weeds is sufficient for this crop. Rows should be about 4 feet apart, with hills containing two or three seeds. Each hill should be about 3 feet apart. Although pumpkin plants produce a profusion of flowers throughout the life of the plant, however, as a rule of thumb, about 2 pumpkins per vine can be expected. All pumpkins produce separate male and female flowers on the same plant for natural pollination. While pumpkin size is generally controlled by genetics, any factor that limits plant growth will adversely affect it's size. This includes water, temperature, insects , diseases, pollination, fertility, soil type, plant population, weeds, etc. When ripe, the pumpkin can be boiled, baked, steamed, or roasted. In its native North America, it is a very important, traditional part of the autumn harvest, eaten mashed and making its way into soups and purees. In Mexico and the U.S., the seeds are often roasted and eaten as a snack. Often, it is made into pie, various kinds of which are a traditional staple of the Canadian and American Thanksgiving holiday. Boiling/Steaming Method: Cut the pumpkin into rather large chunks. Rinse in cold water. Place pieces in a large pot with about a cup of water. The water does not need to cover the pumpkin pieces. Cover the pot and boil for 20 to 30 minutes or until tender, or steam for 10 to 12 minutes. Check for doneness by poking with a fork. Drain the cooked pumpkin in a colander. Reserve the liquid to use as a base for soup. Follow the steps outlined below in Preparing the Puree. Oven Method: Cut pumpkin in half, scraping away stringy mass and seeds. Rinse under cold water. Place pumpkin, cut side down on a large cookie sheet. Bake at 350°F for one hour or until fork tender. Then follow the procedure outlined below in Preparing the Puree. Microwave Method: Cut pumpkin in half, place cut side down on a microwave safe plate or tray. Microwave on high for 15 minutes, check for doneness. If necessary continue cooking at 1-2 minute intervals until fork tender. Follow the steps below to puree the pumpkin. When the pumpkin is cool enough to handle, remove the peel using a small sharp knife and your fingers. Put the peeled pumpkin in a food processor and puree or use a food mill, ricer, strainer or potato masher to form a puree. Cleaning: To remove dirt, bacteria, and possible pesticide residue, wash vegetables thoroughly in cold water. Dry completely before storage, especially if refrigerated, to discourage growth of bacteria and mold. Before preparation, remove the stem with a sharp knife, and scoop out the seeds and scrape away all of the stringy mass. Store whole pumpkin in a cool (50 to 60 degrees F) dry area. Will keep several months if mature and stem is still attached. Pumpkin puree freezes well. To freeze, measure cooled puree into one cup portions, place in ridged freezer containers, leaving 1/2-inch headspace or pack into zip closure bags. Label, date and freeze at 0°F for up to one year. History: References to pumpkins date back many centuries. The name pumpkin originated from the Greek word for "large melon" which is "pepon."